1 qt. Chicken Stock (if boxed, use one large box) . 5 - 6 whole large potatoes cut into 1 1/2 inch cubes (if Russets or baking potatoes, peel. If Red or Yukon Gold no need to peel) . 1/2 block velveeta cheese cubed. Garnish bacon crumbles, chives, sour cream, shredded cheese. 1. In a large heavy stock pot, heat 2 tbs of olive oil. 2. When hot, add onions and cook over medium heat until translucent – 2-3 mins. 3. Add garlic and cook for another 1 minute. 4. Add Chicken stock, water and salt to pot. 5. Add potatoes and carrots to stock pot and bring to a boil. 6. Boil until potatoes are fork tender. 7. Turn burner off and allow to cool until able to remove about ½ of the potatoes with a slotted spoon to a food processor or blender. 8. Process until potatoes turn into a paste and then add back to the stock pot. 9. Place stock pot back on the burner and on medium heat, add milk, cream, butter and Velveeta cheese and heat until butter and Velveeta is melted. 10. Do not bring to a boil – adjust heat to low as temperature nears boiling. 11. Stir frequently with wooden spoon and scrape bottom of stock pot frequently to prevent sticking. 12. Add sharp cheddar one handful at a time, stirring each time. 14. Add salt and pepper to taste (will vary greatly depending on types of cheese you use – so add a little, taste, repeat). 15. 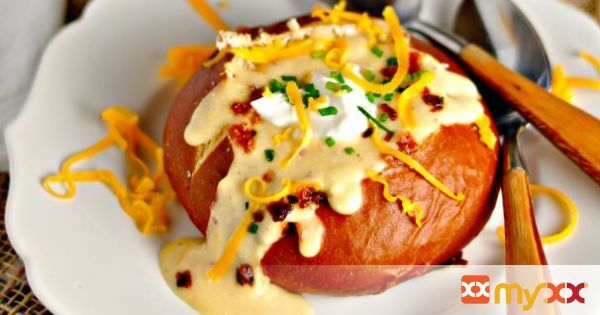 Serve in bread bowl, soup bowl or mug. 16. Garnish with bacon crumbles, chives, sour cream and shredded cheese.